3a. Walk away from her window and past the gate will trigger a dialog of the sister talking to herself. Who... are you? I don't know your voice, but I know that smell... Are you a hunter? Then, please, will you look for my mum? Daddy never came back from the hunt, and she went to find him, but now she's gone, too... 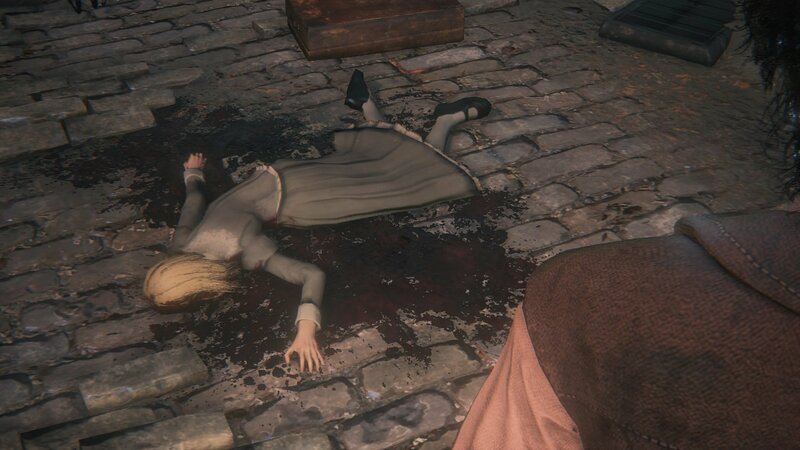 I'm all alone... and scared..."
(From this point on, it's the Little Yharnam Girl's older sister speaking)"Oh, you haven't by chance... seen my little sister, have you? I told her to look after the house, but she's run off somewhere. She's still quite small, and wears a big white ribbon. Have you seen her out there anywhere?" Even if you withhold information from the little girl she (presumably) still dies. If you kill the boar in the sewage tunnel after reloading the game you will find the Red Messenger Ribbon. So it is speculated that she tried to run away from home after hearing her parents were both killed by you. It is possible that the older girl is not in fact Gascoigne's daughter, as the younger girl never mentions her and the older girl hesitates before asking if you've seen "[her] little sister". The older girl seems much more concerned about acquiring the younger girl's ribbon than her well being as well. Additionally the voice heard talking about the sister may just be the troll at the bottom of the ladder. i tried to save the girl but couldn&apos;t maybe using the red jeweled brooch on the altar of despair and her mum revived and everyone was happy . maybe using the red messenger ribbon will have a similar effect? The voice talking about the sister is definitely the troll at the bottom of the ladder, if he&apos;s dead the line doesn&apos;t play, and it gets louder if you sneak up to him. If you have the red ribbon on the messengers, when you give it to her, you don&apos;t lose it. I was thinking If I kill the giant pig and (just to be sure) the brick troll, and then talk to the girl whiteout reloading the area, could be possible for her to reach the Chapel? I killed wet nurse and went back to the house where the little girl was. I’ve completed her entire quest line so the house was empty. As soon as I approached the area i heard the tune of the music box/Mergo’s lullaby. Has someone experienced this too? I think they could’ve done better with this character. 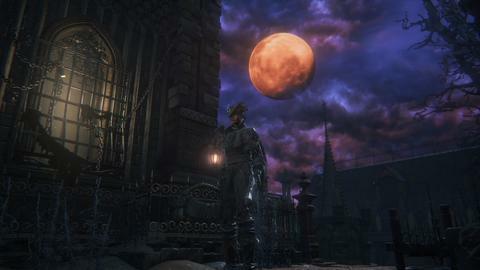 It would be more interesting if she could make it to Oedon Chapel where you could converse and learn more about Yharnam’s history or Gascoigne. Don&apos;t bring the broach back to the daughter. Bring her the Yharnam Stone that you get from the Chalice Dungeon. If you use the broach and make it into a gem, then kill the blood queen for the Yharnam Stone, bring that back to the daughter and she&apos;ll give you the "Yharnam Haze" which can then be applied to whatever weapon of your choice. This will transform whatever weapon you choose into a lightsaber-type weapon. This is extremely useful for going into the DLC because the Yharnam Haze weapon will pretty much mow down anything. I don&apos;t know how or why, but now after I killed Rom the retarded spider instead of the older sister there speaks a guy that can be normally spoken through a door in old yharnam. He says something about going right at the church where you fight Amelia Vicar (I think that was her name). Any clue why&apos;s that or does anyone have that happen to them before? It is not a man who&apos;s whispering, it&apos;s the Brick Troll down the Ladder. Actually all the Brick Trolls say this "Oh so cold, dear sister...", or whatever thing. Not just this one. "...after hearing both of her parents were killed by you". Umm... what? I remember only killing only Gascoigne, not Viola. I haven&apos;t seen it mentioned so I&apos;m gonna mention it. You can keep both ribbons if you equip the red ribbon to your messengers and then give it to her. She gives you the white ribbon, and you keep the red one since it&apos;s currently equipped. Probably the best outcome for this quest would be a result of the hunter not even getting involved. The little girl is not the celestial being in the clinic; its there regardless of her status. Ok, so seeing a comment here saying that the girl goes to the clinic after the blood moon. Well... I tested this and this is wrong. I can&apos;t see her anywhere and I haven&apos;t talked to her on that character. So, if you don&apos;t talk to her, that&apos;s the best thing to do. I got the music box but forgot to return to her before beating Vicar. Now I get the "its not fair" dialogue even with the music box in inventory. Did I ruin the questline? So, going through the comments it&apos;s evident that every single option when interacting with the girls leads to the same result - the older one killing herself and the other serving as dinner. Just for the sake of exhausting all possibilities, what happens if you don&apos;t even start a conversation with the girl in the first two moon phases? No one to my knowledge wrote about it. Also, the "So cold, dear sister." line is absolutely unrelated to the girls. I clearly heard the troll that sends the flaming ball rolling down the Yharnam bridge say it. "So it is speculated that she tried to run away from home after hearing her parents were both killed by you." "It is possible that the older girl is not in fact Gascoigne&apos;s daughter, as the younger girl never mentions her and the older girl hesitates before asking if you&apos;ve seen "[her] little sister". The older girl seems much more concerned about acquiring the younger girl&apos;s ribbon than her well being as well. Additionally the voice heard talking about the sister may just be the troll at the bottom of the ladder." why did I get the red ribbon before I even talked to the little girl then?